This is the essential Music Together® class, one that a child can attend from birth up to kindergarten. This engaging class follows the recommendations of child development researchers—grouping children of a variety of ages in one class. This approach fosters natural, family-style learning where younger children enjoy watching and imitating older ones; older children learn by leading younger ones; and adults are happy because the children in the family can go to class together. Each child participates at his or her own developmental level in singing, moving, chanting, listening, observing, or exploring musical instruments. 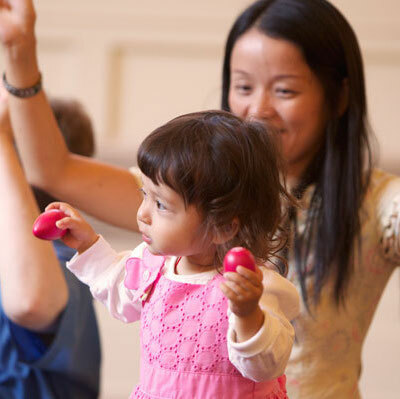 We welcome the whole family to join in this important family music experience and any caregiver—parents, grandparents, nanny—can bring the child or children to class. As a parent, you pay attention to every move your baby makes. Have you noticed their eyes light up when they hear a song? Do they start cooing and wiggling when you sing a nursery rhyme? Chances are you've seen glimpses of the music-maker inside—now it's up to you to bring it out to the fullest! When you sing in the car or dance in the living room, you are setting the model for your baby, who is listening and observing as you play with music. With Music Together, you can learn lots of musical ways to interact and bond with your new baby, supporting their development in these important early years. Since babies are musical beings even before birth, it’s never too early to get started—even newborns are amazingly oriented to become music-makers. Because they begin to hear and respond to sound in the womb, most babies’ sense of hearing is well developed at birth, and they are already alert to musical sounds—especially the voice of a parent singing! Just as your baby is prepared to learn language, they are equally prepared to learn music. Sign up to try a class with your baby! When you bring the power of music into your toddler’s life with Music Together, you offer them a playful learning environment that is also immediately accessible. We provide children a wealth of musical experiences to share with the grownups who love them, as the adults learn to continue the play at home. 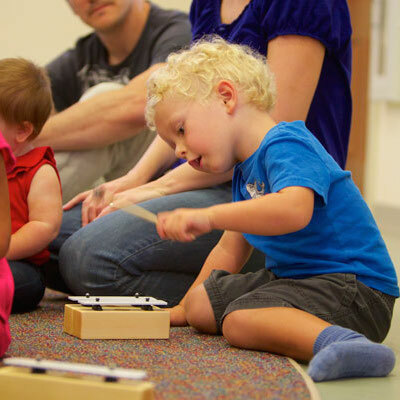 With songs in a range of musical styles—lyrical to blues, world music to folk, along with fun and developmentally appropriate activities, your toddler receives a rich music experience that stimulates and supports their growing skills and understanding. Sign up to try a class with your toddler! In Music Together classes, your preschooler enters a musically rich environment that welcomes their participation, however they choose to engage with it. With songs in a range of musical styles from lyrical to blues and world music to folk, Music Together stimulates and supports your three-, four-, or five-year-old's growing musical creativity, enthusiasm, and skills. Sign up to try a class with your preschooler!